This year's 24th issue of Young Jump magazine has announced that an OVA will be bundled with the 15th volume of Golden Kamuy manga releasing on June 19. It will animate the Barato no Youjinbou arc and will also include a mini manga episode "Kaiki! Nazo no Gyodaitori." 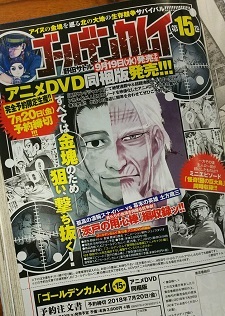 Satoru Noda began serializing Golden Kamuy in Young Jump magazine since August 2014. The 14th compiled volume will be released on June 19. A TV anime adaptation by Geno Studio is currently airing. Yes,hope we get a second season too. Well, the manga has like almost 160+ chapters ... so i hope this OVA isn't the last thing we get. Yup, 12-episode is not enough. Also, the BDs were all delayed by a month to ensure quality improvements. I guess they might re-animate certain scenes or improve the artwork for scenes that looked iffy. Hopefully it's similar to the improvements seen in the JoJo BDs. You mean like they will redone that CGI bear ? lol. Not sure about the CGI, but they'll probably redo some animation cuts. Episode 2 might get a lot of improvements due to its somewhat poor artwork. But if the bear's CGI is redone to something similar to Retar's, that would be much better.